The Knicks Can’t Be Stopped! "It's been maybe the hardest month I've ever played in, maybe in my career," he said after Monday's game. "So many games, so many back-to-backs, then they threw in the makeup game in this month. So it was very, very tough. And on top of that, we're trying to get used to our new teammates, so it was a tough month for us. 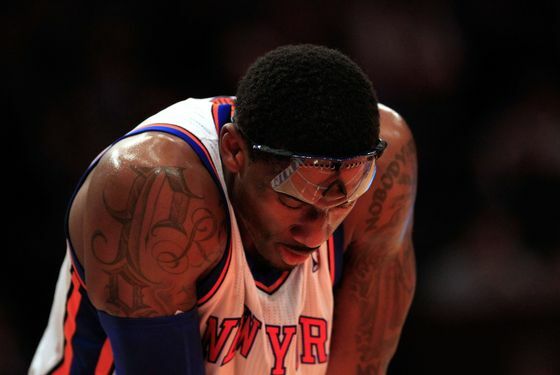 But hopefully we can cap it off against the Nets with a win." Indeed. A victory over New Jersey and a two-game win streak would be a great way to go into a much-needed three days of rest. It won't be easy, though. It feels appropriate for some reason to discuss the losing streak in past tense, but Monday's gritty win over the Magic might very well have been a fluke. The bitter taste of losses to Cleveland, Detroit, and Milwaukee still lingers, so even the most decidedly lottery-bound of clubs shan't be taken lightly. The Nets, for their part, fully intend to put up a fight. They'd quite like to gain some ground in the budding crosstown rivalry, and the fans are understandably treating this as kind of a statement game following Carmelo Anthony's jilting of an opportunity to join their ranks. And while the Knicks are depleted to the point that Shelden Williams will start, Deron Williams is expected to give it a go tonight. So, yeah. It should be a fun one. The Nets feel they have something to prove, and New York would very much like to end this March like a lion. Well, not this lion.